It’s time to raise a glass of Lambrusco to Heston Blumenthal as he gives the 1970s treatment to a classic Italian bread. 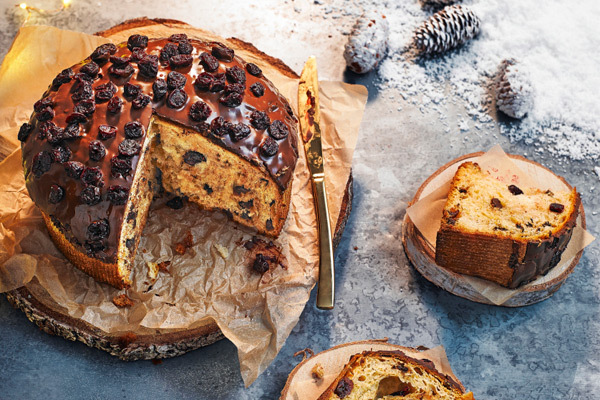 The chef has taken the dark chocolate and kirsch-soaked cherries from a Black Forest gateau – his favourite dessert – and added them to a panettone. Blumenthal is known for drawing on nostalgia to create clever combinations for his dishes. In this case it was the nation’s affection for a German dessert that made its way to Britain – thanks to the advent of the package holiday – in the decade that also brought us Greek moussaka and Swiss fondue. takes two to three days to prepare, he advises. Blumenthal has also used the same flavours in a pâté, also destined for the aisles of Waitrose, which will contain layers of smoked venison and smooth venison with chocolate, topped with a layer of sour cherry and kirsch. The Waitrose 1 Black Forest Venison Rack (£59.99/1.2-1.4kg) now available from waitrose.com/entertaining is covered in an aromatic cocoa nib, chestnut and sourdough crumb, and accompanied by a rich gravy and cherry sauce scented with orange and port. And another newcomer, the Waitrose Black Forest Sparkle Bar (£13/700g), has cherry and almond flavours, along with a shimmering red finish and rich dark chocolate mousse filling.